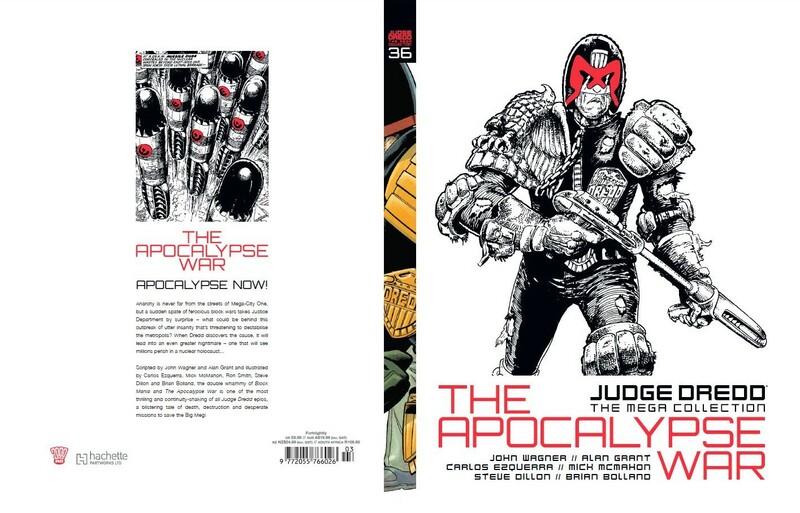 Judge Dredd the Mega Collection: Apocalypse War starts off tame in comparison and slowly builds to a grand finale the likes of which possibly no other comic has ever, or maybe will ever, match. Starting with Block Mania and transitioning into Apocalypse War was not only extremely clever from John Wagner—co-creator of Judge Dredd, who went by T.B. Gover at the time—and Alan Grant, but really served to build the tension and excitement for the rest of the epic, dare we call it, event. If you listen to the 2000 AD Thrill-Cast on this third collected hardback, which comes highly recommended, you can get some more insight on this story and cool little bits of information that really add to the story as a whole. It is however, suggested that you read the story first and for those that might not live in the UK or Ireland, where this collection is available, you can check out the Judge Dredd Complete Case Files Volume 5. Either way, make sure you read it before you listen to the podcast so you don’t get any unwanted spoilers. The artist line-up which includes the lines of Brian Bolland, Steve Dillon, Mick McMahon, and Ron Smith and, of course, co-creator Carlos Ezquerra, might be one of the best-rounded groups that 2000 AD ever had working on one story line. Even though Block Mania was handled by the rotating artists listed above and Ezquerra took on the task of the main story on his own, much to his credit and to the definite benefit of the story, the vision for this story is whole and complete and really doesn’t suffer at the start from the different artists. A lot of them were of a similar class and certainly a weekly deadline would be hard for any artist (again mad props to Ezquerra) so in this case it works in 2000 AD’s favor. Block Mania was actually really complete and felt as though it could have been a story all its own and then Wagner and Grant could have moved on to something else, but the fact that they seamlessly escaladed the events of Block Mania right into Apocalypse War without ever showing their hand, so to speak, was a touch of genius. As a reader, you really didn’t see any of this coming, or at least not on the scale that was presented. The story builds and builds and snowballs into something completely out of control, something that was very much possible in the real world at the time (1982) that this story hit the 2000 AD progs. It mirrors a potential future for the real world, while blowing it up (no pun intended) to insane comic book proportions, but the impact of it all, even reading it well over thirty years later, still leaves a lasting impression. It’s also worth noting that the story, within the Dredd-verse, continues to leave a mark on everything that happens. Characters will mention it from time to time, and there have been many stories following characters involved with this war over the years. It’s not one of those stories that can, or should be, easily forgotten. Everything didn’t return to status quo, as it does in other companies, and you can’t applaud 2000 AD enough for that. Aside from the insane, shocking story that has easily made it into this reviewer’s top 10 stories of all time, there’s the art that we need to discuss. The art for Block Mania was great, don’t think the following is meant as a slight in any way, but Judge Dredd co-creator Carlos Ezquerra turns out some of the best comic book work possibly ever. 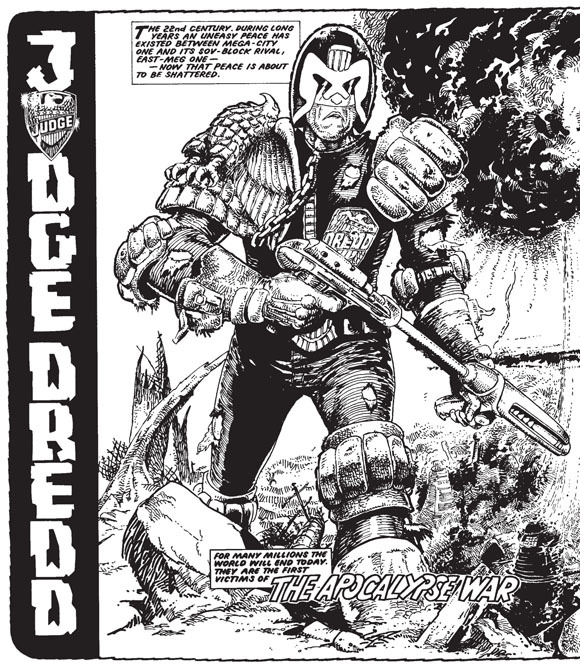 His black and white ink and pen work is something up there with the likes of Moebius and every character, and every panel for that matter, is just expertly crafted and has such a signature Dredd look to it—as it should, being the co-creator and all—that you can’t help but stop and pour over every page and panel. Easily The Apocalypse War goes down as one of the best stories I’ve ever read, and probably just as easily it has to be right up there among the best of the Judge Dredd stories, particularly of some of the earlier works. The black and white work from Ezquerra is impossibly brilliant, and Wagner and Grant take risks and literally change the entire landscape for years to come, with just one story. America was a great starting point for the Mega Collections and Mechanismo was an excellent follow up, but so far The Apocalypse War stands tall over both of them and in the coming collections this is going to be a tough one to beat.